This patient had a strip surgery that left him with a wide scar from ear to ear. He decided to have a scar excision and revision to correct it. The result was good - a thin scar. Then, the patient wanted more hairs on top, so they did another strip. This time the scar stretched back and widened. Also, there was a change in orientation of grafts. With each strip, you are increasing the chance to get wide scar. So, he sought the advice of Dr. Mwamba. Dr. Mwamba was able to offer some new options to this patient such as correcting the directional growth of the hair and grafting into the scar. The scar was pretty wide from ear to ear. There was also a section in the right of the scar that had widened and stretched more than the other areas, leaving a large bald spot in that area. Another problem that many people have after strip surgery is a change in direction. 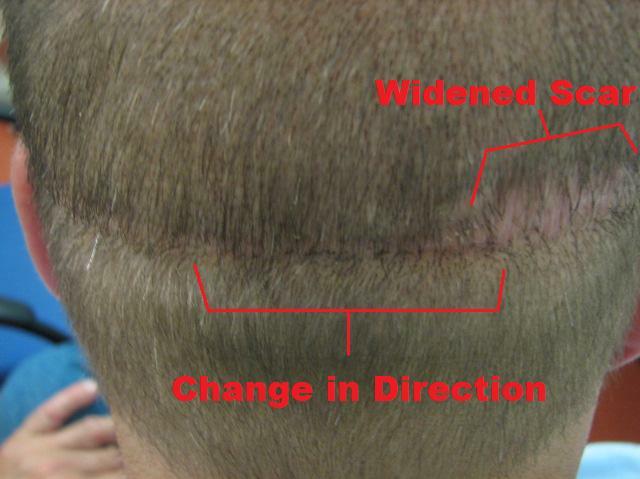 The hair above and below the scar will be pulled and twisted into growing out at odd directions as the wound heals. This makes it very difficult to conceal the scar after surgery. Graft the scar to improve the appearance of the scar tissue and add density to the hairless areas. Correct the change in direction by removing the hairs growing in the wrong direction and replace them in the correct orientation. The change in direction has been corrected, allowing the hair to flow naturally, concealing the scar better. The area of the scar that had widened and stretched may require more than one session of grafting. This is because scar tissue has much less blood flow than regular scalp tissue. Dr. Mwamba has found that the first session of grafting helps to establish blood flow to the scar tissue, preparing it for the second session of grafting. The larger the scar, the more likely it will need two or more sessions of grafting to achieve the desired result. The transplanted hair should be allowed to grow for at least 6 months in between grafting sessions for best results. 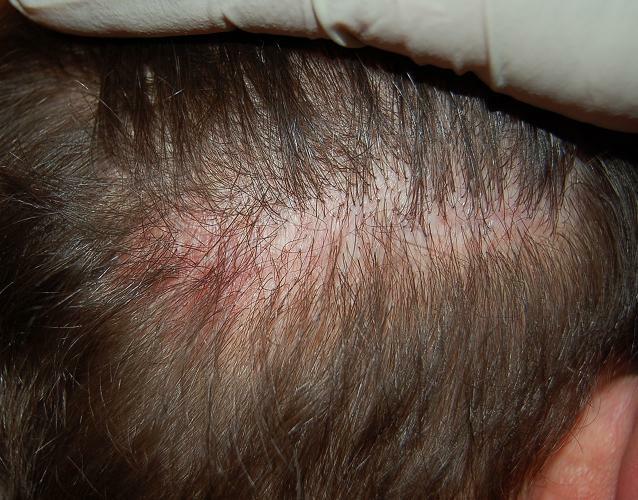 The scar tissue looks much more healthy and more similar to the surrounding scalp tissues. The hair growing in the scar tissue helps to conceal the scar even more. Usually how long it takes for the scar to stretch? Mine is still fine after 15 months, I haven’t really looked at it, it’s a bit difficult to check that in the mirror but it doesn’t feel like it has stretch. Is there anything I can do to prevent stretching? I have never seen only part of a scar stretched while the rest is fine. What is the reason for that and how many grafts did he have? It is happening often that you may think.The scar is never the same or uniform all the way.When suturing a wound you need to keep a certain tension while closing the wounds;and sometimes you may not control and the suture will loosen at certain portion .Another cause of widening scars is the careless attitude of some patients who will not pay attention to decrease the tension on the scalp by avoiding repetitive flexion-extension of their neck;it could loosen up the suture tension.The skin elasticity could also be a factor that explain a stretch back.You got both intrinsec and extrinsec factors that could be responsible for the stretch back.And usually you have to count up to 16 months for the scar to "mature"ie to be in place with no risk of alteration. In this patient ,we did a first pass with 200 scalp hairs harvested by FIT and 200 BHT. 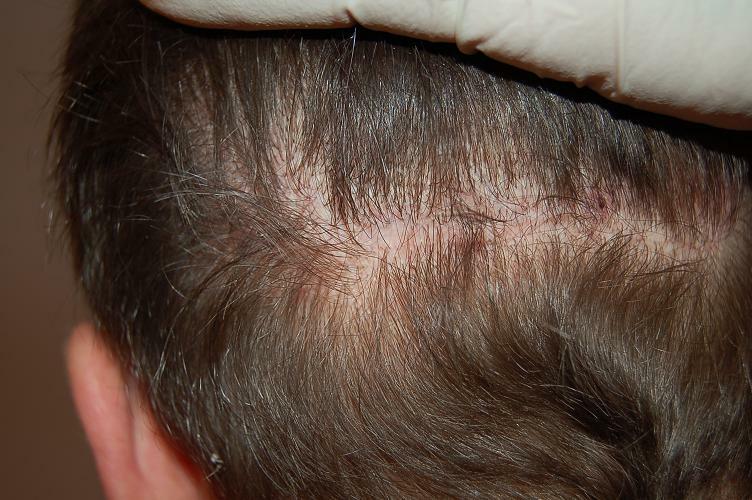 (Lack od good density push us in that plan).Keep in mind scalp hairs is always better to use than BHT for scalp restoration.after one year,hair grew in the scar but there was a surdensity created by a crossing of hairs in different direction at the scar level.Which makes it very difficult to camouflage.We removed 100 grafts from the scar by FIT and reoriented them back in the same incision hole and we added 200 BHT to densify more the scar. We achieve a more natural result than before because hairs flow in the same direction;it eliminates the surdensity in a small region.Notice also we did it in two sessions to improve the quality of the scar in terms of blood supply to increase athe chance of better yield.